Each month, The Canadian Real Estate Association compiles the statistics of existing homes and properties sold through the Multiple Listing Service®. This provides an overview of the existing housing market in Canada, and tracks market trends for prices and properties sold. The detailed reports are available to REALTORS® to help in market analysis. This map will show what the latest statistics for major markets across Canada, based on the MLS® reports provided by local real estate Boards. By dragging your mouse across a specific city, the latest average price will appear. The latest news release dealing with our MLS® statistics is available in the Media Center web page. The number of properties sold via the MLS® systems of real estate boards in Canada edged down further in December 2008 to reach the lowest level for the month since December 2000, according to statistics released by The Canadian Real Estate Association (CREA). 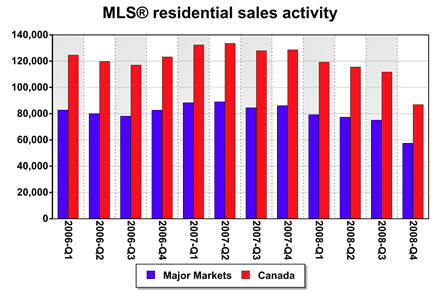 Seasonally adjusted residential MLS® sales activity numbered 27,357 units in December 2008, a decline of 1.8 per cent compared to the previous month. 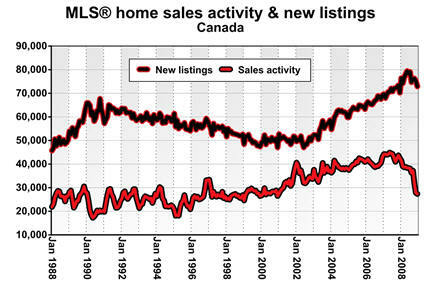 However, seasonally adjusted activity was up in more than half of Canadian housing markets. Activity declines in Montreal, Calgary and Edmonton more than offset a rebound in the number of transactions in Vancouver, resulting in a small monthly decline in national sales activity. The small month-over-month decline in national MLS® seasonally adjusted sales activity in December followed double digit declines in September (-14.9 per cent) and October (-12.1 per cent). Activity plummeted 22.2 per cent in the fourth quarter of 2008 to 86,879 units, with seasonally adjusted quarterly declines in activity in all provinces. The sharp drop in fourth quarter activity accounted for over half of the decline in transactions since the peak in 2007. The number of properties sold via the MLS® systems of real estate boards in Canada edged down further in December 2008 to reach the lowest level for the month since December 2000, according to statistics released by The Canadian Real Estate Association (CREA). 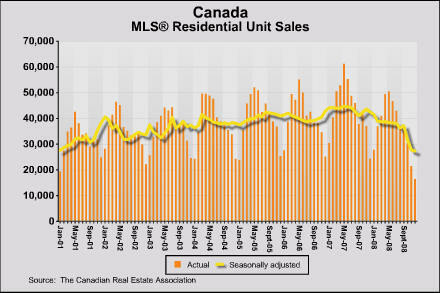 Seasonally adjusted residential MLS® sales activity numbered 27,357 units in December 2008, a decline of 1.8 per cent compared to the previous month. 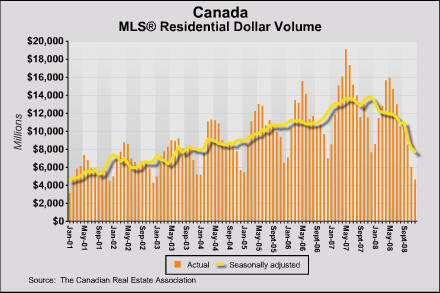 In line with the trend in sales activity, MLS® residential dollar volume declined 17.7 per cent to $132 billion in 2008. Annual dollar volume set new records in Saskatchewan, Manitoba, and Newfoundland and Labrador. Year-over-year declines in the MLS® average home price were reported in about half of local markets in December. Lower activity and average prices compared to one year ago remain most pronounced in Canada’s more expensive housing markets. This continues to weigh on the national MLS® residential average price. The national average price of homes sold via the MLS® in December 2008 declined by 11 per cent from where it stood a year ago. 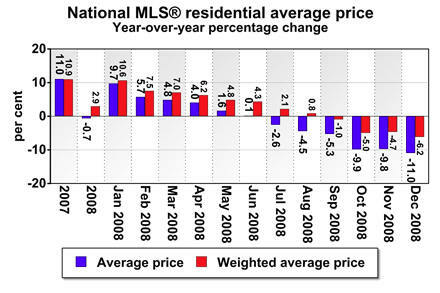 The major market price trend was similar to the national trend, down by 9.9 per cent year over year in December 2008. The price trend is similar but less dramatic for the weighted national MLS® average price, which compensates for changes in provincial sales activity by taking into account provincial proportions of privately owned housing stock. The weighted national MLS® average price dropped 6.2 per cent year-over-year in December 2008, while the weighted major market average price declined 2.9 per cent. Seasonally adjusted new MLS® residential listings numbered 72,931 units in December, down three per cent from levels recorded in November. New listings are trending lower. In December, they stood 8.1 per cent below the peak reached in May 2008. Resale housing market balance is represented by sales as a percentage of new listings. The rise in the number of new listings in the first half of last year along with declining sales activity, particularly in the fourth quarter, resulted in an increasingly balanced resale housing market over the course of 2008. Sales as a percentage of new listings in the fourth quarter of 2008 fell to the lowest level since the mid 1990s. 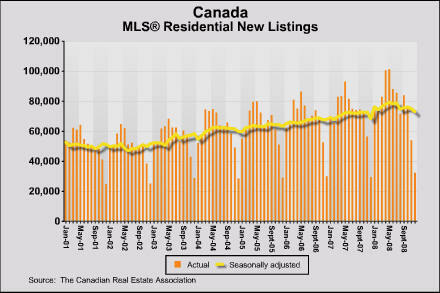 New listings are trending down from the peak reached in the second quarter of 2008. If this trend continues, the balance of supply and demand will stabilize in 2009.